Is this game really cool? Mate, it doesn't matter how much I have and I will never say how much I have. Let's just say that I have: "enough" haha. Just participate in a lot of contests and make sure that you show the best of your skills! Thanks. I'm having doubt I can take place to win this weekly leaderboard. The posts aren't approved yet. My posts are my only hope. Your posts will be approved anytime from the minute you add them until tonight at Midnight (PST). This means that they don't need to be added right away. Sometimes, the guides are added until the night of the contest, which is tonight. So, don't be nervous about your guides being accepted :). I like your good work mate :D Keep on doing that! Thanks! I just made it to the top 3. <3 love it. hope I can atleast maintain my position. How long will it take to approve my guides? Your guides will be approved any time from the minute you add them until Saturday at Midnight (PST). 1-3 days, or at Saturday. Please be patient, the FanCoins will come soon. How should I know, maybe check if your guides are confirmed? So bonus means confirmation of a guide? If it says ( ex. "submit tip" ), then It has been confirmed. I think it's not. A bonus is a bonus. It clearly said it. It gave me 110. Guides give us 50 coins only. A guide can receive a ton of FanCoins. 50 FanCoins is not the limit. You can receive a lot more than that. My most is 1,100 FanCoins on one guide. You can get a variety of fancoins. The long, checked, and well made, will give you more fancoins. It's is a glitch, even though, you submitted for example a Article. It will say "submit tip". It didn't. That's good, it means I can have more coins in the future. :D wow this conversation is really long now. Let's stop before it might be considered as spam, should we? Jon is likes me too much, so he will let me win this week. Just wanted to add, the leaderboard ends on Saturday and that most of the guides actually get approved on Saturday, just before the system starts again so don't worry if your guides doesn't get moderated straight away. Welcome to FanUp, I hope you have a great time here! Hello mate, welcome to our number one gaming community Fanup!! At Fanup, you locate gaming friends in every corner, including myself. 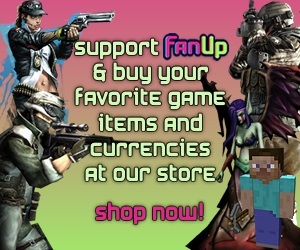 Want some Fanbucks for your favorite game? Join the recently held contests for tons of Fanbucks as awards. Only need a bit more to fill you account full with Fanbucks? Get the surveys down and you'll grab some fast and easy Fanbucks. To be honest, the contests are surely fun and exciting. Feel free to contact me or any other guardians and moderators for more information on Fanup. Send a personal email to "community@fanup.com" if you face any technical problems. Good luck, have fun here and Cheers! !